Here is the first video that I’ve filmed myself for Travel Video of the Week. It’s filmed on my iPhone, so don’t expect too much in terms of quality! It’s a short and fun clip from a recent trip to London and is filmed in the depths of the Camden Markets. 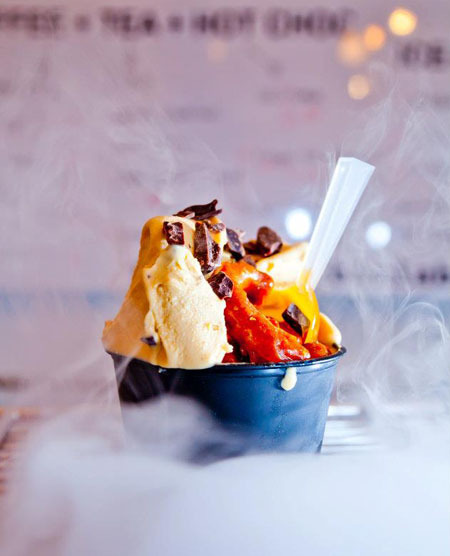 There is a shop there called Chin Chin Brew Bar – and as well as doing amazing hot chocolates they also make ice cream that is frozen with liquid nitrogen! The video is a quick peek at the billowing and smokey process and a friendly chat to the owner as he makes our tasty treats. If you’re in Camden, I highly recommend them – it was seriously awesome ice cream! The delectable frozen ice cream made with Liquid Nitrogen!